The warrant of Lodge No. 95 was issued to Brethren in Cashel on the 1st of December 1738 and was signed by Lord Mountjoy, the Grand Master. It is likely that the Lodge was working for some years prior to this. Following the issue of the Warrant it appears that the actual duration of the Lodge in Cashel was quite limited and it survived there for only a year or so. On the 17th of May 1748, Bro. John Calder was requested by Grand Lodge to make a report on the working of various Lodges in the Munster region and to collect dues. In his report as regards Lodge No. 95 he stated ‘no Lodge assembled there these past nine years’. The Dominick Sarsfield appointed above was a descendant of General Patrick de Sarsfield, Earl of Lucan. He lived in Glanmire, Co Cork at Sarsfield Court. 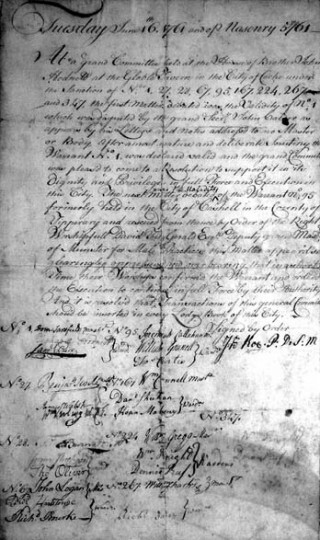 The situation became somewhat confused during 1758 when Brethren in Cashel submitted a letter to Grand Lodge stating that their Warrant had been lost and requested a duplicate one. This was considered at the Grand Lodge Meeting on 24th June 1758 and surprisingly, a duplicate was issued. The outcome was that two seperate Lodges were now operating under the Number 95. This led to enquiries being made by the Grand Secretary [John Calder] which resulted in a meeting of Cork Lodges on the 17th June 1761 to consider and inspect the Lodge 95 Warrant. The Warrant was approved, held to be valid and a report sent to Grand Lodge to this effect. After a protracted perod of correspondence lasting ten years the matter was finally dealt with at a Grand Lodge Meeting on the 1st August 1771. It was decided that Warrant No.95 was properly established in Cork by David Fitzgerald on the 24th June 1750 but registration of this was neglected and accordingly a duplicate was improperly given to Cashel. Grand Lodge cancelled the duplicate and confirmed the original as rightfully belonging to the Brethren in Cork. 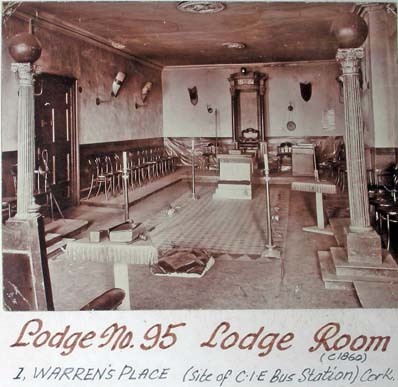 It is interesting to note that at this time Lodge 95 was one of thirteen Lodges that met in Cork. These were Nos. 1, 25, 27, 28, 67, 95, 167, 224, 295, 347, 383, 395, and 400. The meeting places of Lodge No. 95 have been many and varied over the years. 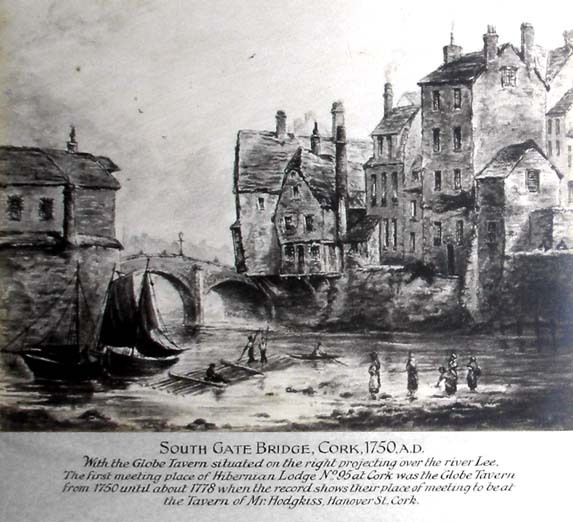 The first meeting place in Cork was the Globe Tavern on the south side of the South Gate Bridge at the bottom of Barrack Street, where meetings were held from 1750 to 1771. In 1772, lodge met at the house of Bro. Thomas Holland, the first of a series of brethren who housed the lodge, for later that same year they removed to the house of Bro. Peter Parks, in 1773 met at the home of Bro. Thomas Healy (where the decision was made to obtain a set of silver collar jewels for the use of the lodge officers) and from 1774 at the home of Bro. John O’Brien of Barrack Hill. The tavern of Bro. William Hodkiss in Hanover Street served as the principal meeting venue from 1776 until his death in 1822, although meetings occasionally were held elsewhere, as in 1789-90 at the homes of Bros. Coughran and McCarthy. Meetings were held in various locations during 1823-24 including South Main Street, Parliament Street, Georges Street and Coburg Street. The Lodge returned to Hodkiss’s Tavern in 1824 at the invitation of his son, where it remained until 1844 when it moved again, firstly to No. 6 Coburg Street and then to the New Royal Oyster Tavern in Market Lane, where it remained until 1857. Of all the taverns used by the Lodge the Oyster Tavern is the only one which is still open. 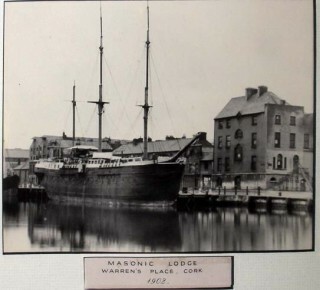 Lodge 95 met at No.1 Warren Place [later renamed Parnell Place] where the Bus Station is now built, in 1857-59, and at Messrs. Bible’s of Pope’s Quay from 1859 until 1866, moving that year to Broad Street. During this period, in January 1862, the several lodges of Cork city decided to discontinue the practice of sending out visitors as heretofore on the occasion of the Festival of St John in June and December, but would be most happy to receive visitors at all times. In October 1870, the Lodge 95 moved to 32 Maylor Street, owned by Lodge NO. 8, where Third Lodge of Ireland had been a tenant for some time. In 1926, all the lodges of Cork city came together at the First Lodge of Ireland rooms, 25-27 Tuckey Street, where we have been meeting ever since. This number was issued to CASHEL, Co. Tipperary, 1 December 1738 but in 1740 was called in by Provincial Grand Lodge authorities at CORK, and in 1749 it was noted ‘no lodge assembled these nine years’ (Calder, 1749). It was officially transferred to CORK, 24 June 1750, by David Fitzgerald, P.G.D.M. of Munster; in the meantime, Grand Lodge of Ireland issued a duplicate warrant to CASHEL, 24 June 1758, where some 40 members registered between this date and 1764, so that for some years there were two No. 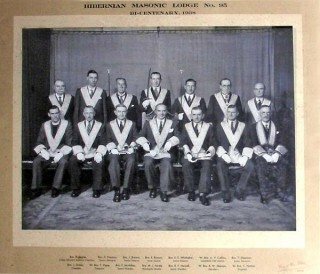 95 meeting (Vide Transactions, Lodge of Research, 1927, 212). 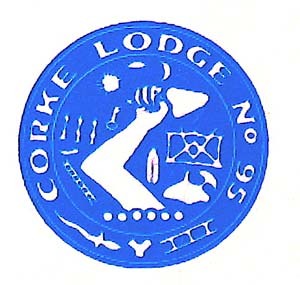 The meeting at CORK was confirmed by Grand Lodge, 1 August 1771. Its warrant was suspended 1 October 1857, and restored 6 May 1858 under the present ‘Hibernian Lodge’ title, which is worked to this day.